When I was in school, there was a Burmese family in our neighborhood and they used to make this gorgeous dish. I heard about coconut milk being used in cooking for the first time through her. She once verbally told us the recipe but I am not so sure how accurate my version is. Still it is an extremely yummy way/excuse to have pasta. Btw it is very commonly mispronounced as Khaosay. It has an unusual element for the sauce, gram flour (baisin in Urdu), which is very widely used in Pakistani foods. Plus it suits my gluten free requirement too. I have used chicken chunks which can be easily substituted with minced meat or beef. What makes this dish extra special is the variety of texture in one plate! The sauce itself is thick and velvety, topped with some chopped onions, tomatoes and boiled potato pieces. The list doesn’t end here; there are potato chips( preferably spicy thin ones), boiled eggs, fresh coriander/mint leaves, fried onion and garlic slices, cucumber, pickles, olives, chillies, crackers etc. It is like biting into layers of texture …. practically a whole party going on! In a medium heavy base pot, heat oil and saute onion, 2-3 minutes. Add chicken with ginger and garlic and cook till chicken is no longer pink and almost all the water from chicken dries up, stirring at 20-30 seconds intervals for approximately 2-3 minutes. Add tomato puree,if using, salt, red chilli, coriander and cumin powder. Add 1-2 tbsp of water to prevent burning. Blend gram flour, yogurt and coconut milk together ( using a blender will make this super easy) and add to chicken, keep stirring for like 2-3 minutes otherwise gram flour could form lumps. When the sauce thickens cover the pot and let it simmer for 7-10 minutes, stirring at regular intervals to prevent lumps and sauce sticking to the pot base. Remove from flame and without removing the lid let it rest for 2 minutes. Stir in lemon juice. 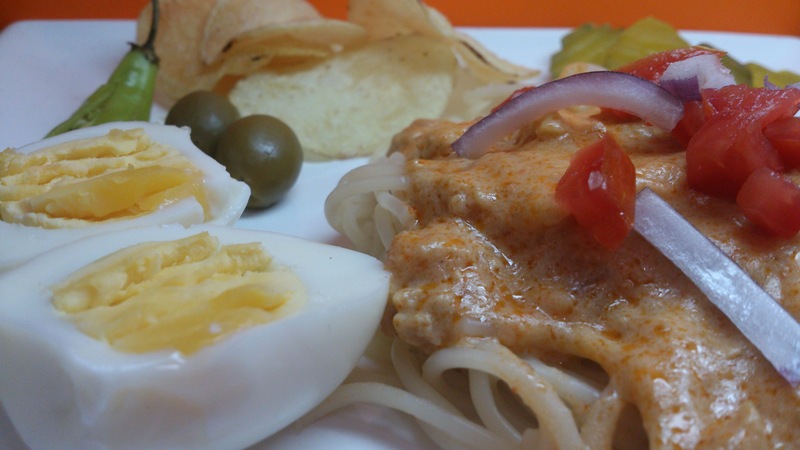 Serve khao suey over the bed of boiled pasta/rice or separately and use any toppings you like from the suggestions. Try your own combos and let me what works best for you. I prefer spaghetti with Khao Suey. You can serve individual platters or serve toppings separately in small bowls to let everyone add what they like. I add tomato puree only because I like the sauce color better this way. You can up the spice level as you wish.